Makino Plant Technical Center｜Technology & Quality｜Tokuden Co., Ltd. The Makino Plant Technical Center greets visitors from home and abroad and allows them to observe actual finished products. The Makino Plant Technical Center on the premises of the Makino Plant is a dedicated test and demonstration facility for various roll products. If you have a sample, we can provide you with a demonstration to experience the latest roll technology. In addition, by employing test calender equipment, we can conduct various tests and sample production under different conditions. 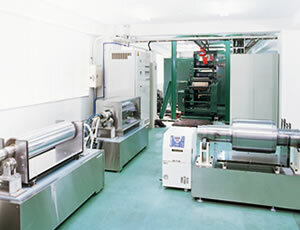 Moreover, the facility offers not only roll technology, but also many other new equipment and production technologies. The Technical Center is a place for technical exchanges between customers and us. By conducting research and experimentation in joint product development with customers, we can design and develop the best system for our customers. Our test machine is equipped with six different types of rolls to allow testing under multiple conditions at the same time and without requiring roll changes. We can conduct thermal processing tests with actual webs (paper, film, nonwoven fabrics) yielding data which can help you develop products or improve operations. Our test equipment also gives you a first-hand look at the outstanding performance of Tokuden Jacket Rolls. Application： Thermal Processing of Metallic Foil, etc. During new product development testing, we were able to freely adjust the temperature on Tokuden's Pilot Calender and quickly find optimal conditions. This helped us develop new products more quickly. Tokuden is the only place in the world where you will find devices that can do testing at uniform, high temperatures such as 400℃. With the incorporation of new equipment comes a lot of anxiety on many fronts. We were able to cast aside that anxiety with the Tokuden Pilot Calender since we tested and confirmed the finished product that we had envisioned beforehand.